Our work starts in earnest now with retailer’s stock scheduled to consigned and sent, then their own photography and all the razzamataz preparation in-house for the festive season. Our studio sale stock is planned and thankfully commissions are still flooding into the studio. We are at about cut-off point for early December 2009 commission delivery, now. The scrap above is from an American antique album that had been broken down and sold separately by the leaves, in Bisbee Arizona. I only managed x10 double-sided pages but these joined the many Australian scrap books in the urban_archaeology collection. 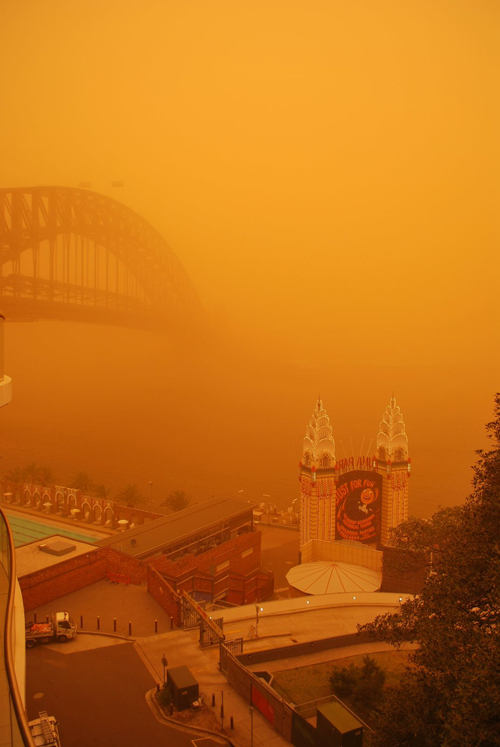 Allan Duncan sent this shot of Sydney. In Brisbane, the sun at 2:00pm was blue through the dust haze, and as it reflected on vehicle windscreens it was most eerie vignetted blue–purple. The Australian this morning has all the info re: parts & particles (micrograms per cubic meter) here. So last night I got out our trusty apartment odorator (from c1840 below) in the hope of spreading millions of small perfume particles into our part of the world – and it worked, today is as clear as . . . the day before. “Good Morning Dust Storm Survivors”… Today everything is covered in dust even inside the house, your furniture will have a thin film of dust over every horizontal surface. Please be careful when going to clean these surfaces ! They will scratch if not careful If you follow our CARE PROGRAMME, your furniture will look great again in minutes! CLEANING . . . When dusting and cleaning use a slightly damp cloth along the length of the grain; this will pick up the dust and not spread it. Then dry along the grain. Clean up spillages, especially alcohol ASAP Then apply a thin coat of wax or oil, we recommend Feed and Wax or Orange Oil. 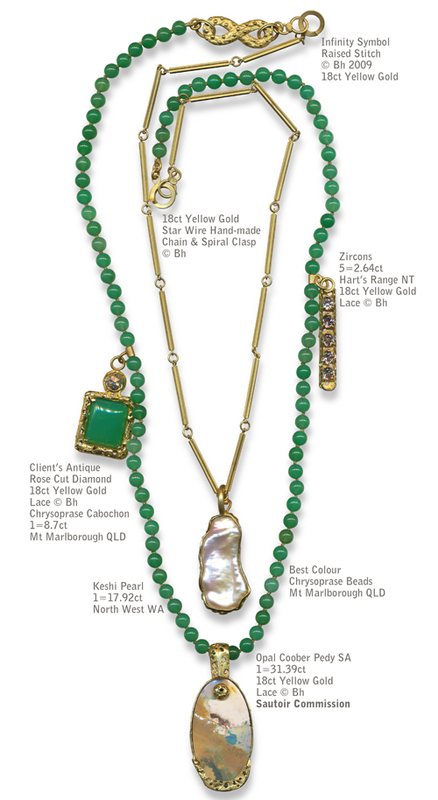 *These wonderful products and more, can be purchased from our shop; Lace and Bark, 18 Station Street, Nundah, Brisbane. Phone 3266 1000. Good Morning Dust Storm Survivors… Today everything is covered in dust even inside the house, your furniture will have a thin film of dust over every horizontal surface. Please be careful when going to clean these surfaces ! They will scratch if not careful If you follow our CARE PROGRAMME, your furniture will look great again in minutes! CLEANING When dusting and cleaning use a slightly damp cloth along the length of the grain;-this will pick up the dust and not spread it. 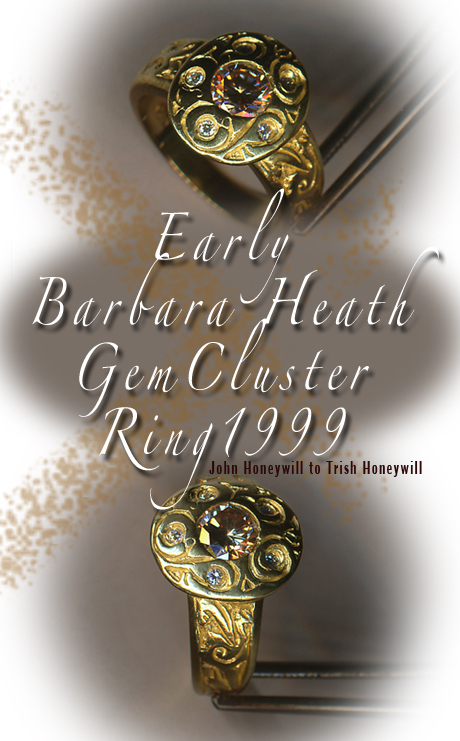 We recycled the client’s 22ct Gold and Antique Diamond from an older ring, all the gemstones had to be Australian and as we know each source personally we were overjoyed that favourites found a new home. The main drop pieces all have removeable clasps, the chain has the © Bh spiral clasp. 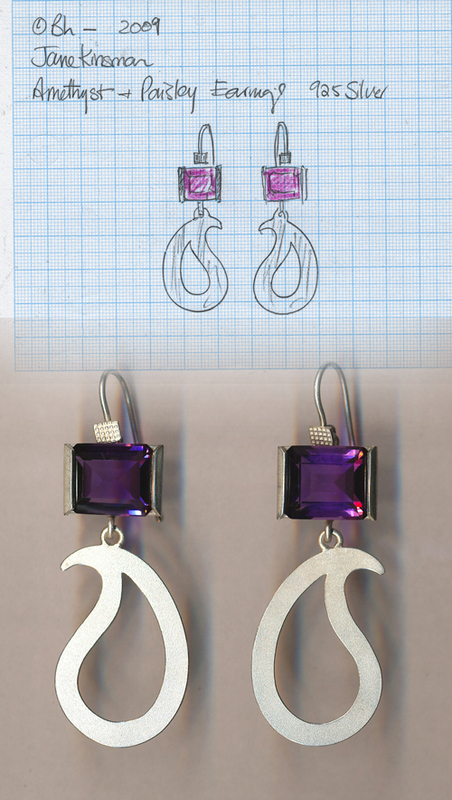 Drawings and scans of each gem was produced in the studio, versions costed and emailed to the client. 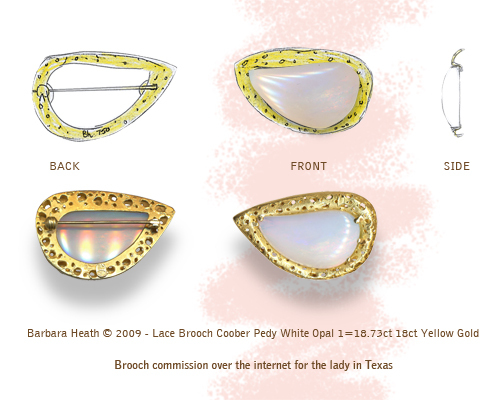 The Lady from Texas then not only committed to the Sautoir but requested a Lace brooch to be made for her Mother-in-Law with her other favourite White Opal . . . all in time for her 50th Birthday!
. . . the bean print was one of our gifts and here are the shots of Barbara’s sister, Suzanne Heath’s 60th Birthday lunch venue at Currency Creek, Kingsbrook Winery, South Australia. Three necklaces from Oman recycled, all with added elements, all restrung and finished with © Bh clasps. 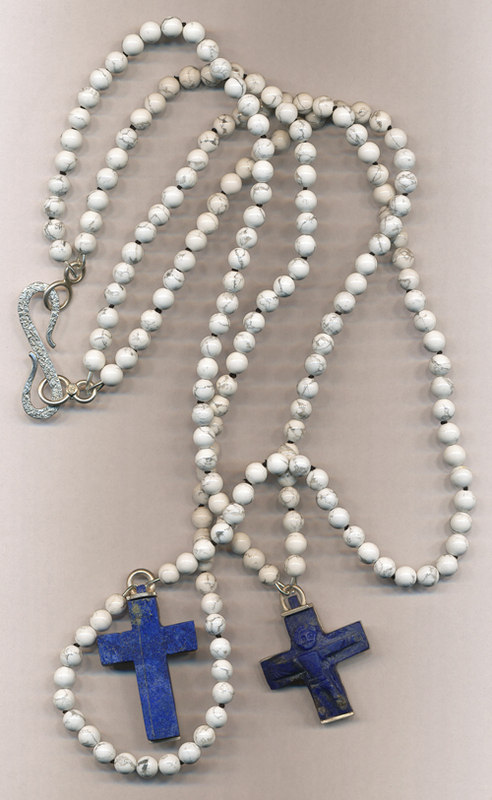 Here’s one with two antique Lapis crosses, Howlite sphere beads and Barbara’s textured (S) clasp.
. . . also here’s a before and after shot – the fourth commission just before the client has seen it! (they are just sorting the third necklaces’ length at the moment)! This is actual real-time reporting . . . 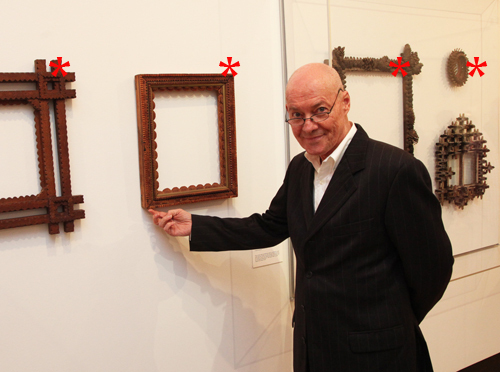 The Ipswich Art Gallery collections staff handled the pieces so well we can’t bear to unwrap the returned items. In the meantime I have cleaned the other 26 folk art frames, fixed them with white matts and glass and now the entire collection is wrapped & ready for the shelves. Everyone comes to the table with thoughts, colours and usually a precursor after looking through the ‘commission’ category on the blog. Rob looked through the product in the studio about to be consigned, thinking it would be a simple in-and-out affair but he had specific colours in mind (reds & oranges). 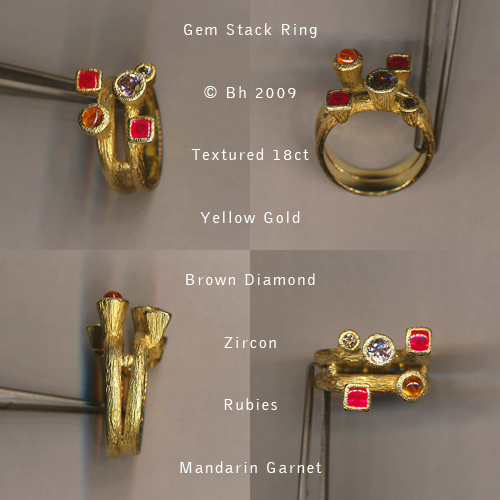 After looking through the numerous © Bh band options and the gem trays the commission evolved. This one came with a time deadline and went out with a day to spare (and we are told it was passed on the same evening). We love the Brisbane City Council’s continued development and resources allocation to this public place – especially the public art & sculpture . 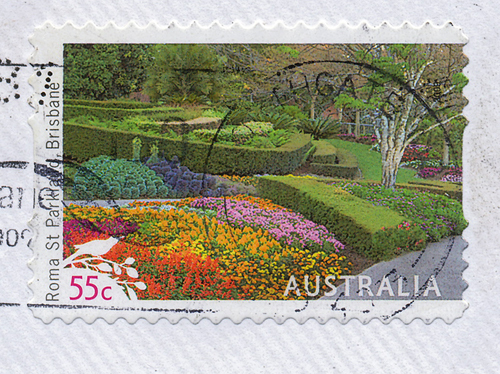 . . we are both members of the Australian Garden History Society (link) as well so we applaud Australia Post for their recent stamp series. This is the first one that I’ve seen, I’m just hanging out to see if they have covered some of the contemporary artworks as well? Scott Redford’s stainless steel ROCK for instance and Rhyl Hinwood’s fantastic carved and coloured Helidon sandstone seat for starters. As an aside – The AGHS Queensland Chapter’s next meeting, this Saturday will be a treat, we love John Slaughter’s wit and energy – not to be missed everyone! The Gothic Revival a Curious Tale. John’s talk finds the beginnings of the Gothic Revival movement in the English garden, gradually taking over from the Classical in the 18th C.
Gardens or estates with the ruins of old Gothic buildings, erected in medieval times, used these to create landscape effects and emotional responses which were quite different from those of the Classical temples and bridges. 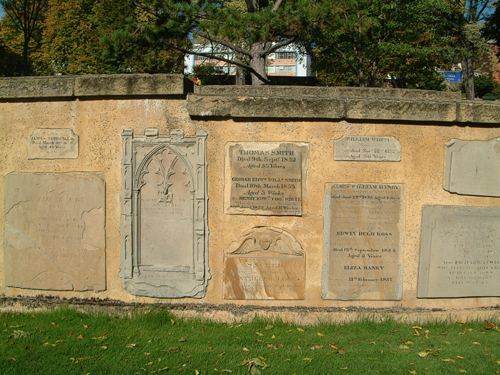 John will trace how these garden design movements lead to the construction of new buildings in the Gothic style and so to the Gothic Revival, which has had such a great impact on art, architecture and culture generally. 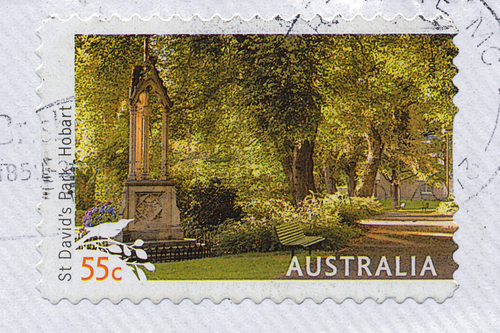 Gothic Revival was at its peak in the 19C but traces of it can be found in the 21C, and John will comment on evidence of the style in Brisbane. There were some unusual and interesting people associated with the movement and John will tell the story of some of these. 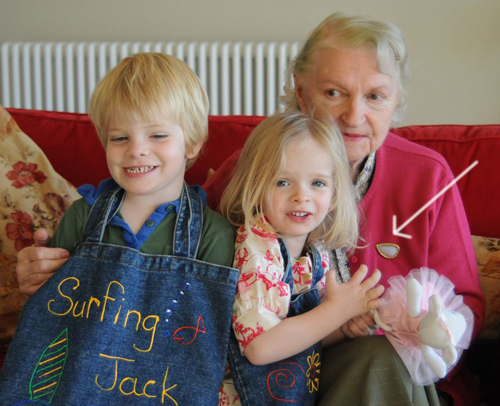 John is an entertaining presenter and has many pictures to illustrate his story. Where: the Herbarium conference room, Brisbane Botanical Gardens, Mt Coot-tha. Time: 2.00 pm on Saturday 5th September. Costs: $10 for members and $15 for visitors. John’s talk finds the beginnings of the Gothic Revival movement in the English garden, gradually taking over from the Classical in the 18th C. Gardens or estates with the ruins of old Gothic buildings, erected in medieval times, used these to create landscape effects and emotional responses which were quite different from those of the Classical temples and bridges. John will trace how these garden design movements lead to the construction of new buildings in the Gothic style and so to the Gothic Revival, which has had such a great impact on art, architecture and culture generally. Gothic Revival was at its peak in the 19C but traces of it can be found in the 21C, and John will comment on evidence of the style in Brisbane. There were some unusual and interesting people associated with the movement and John will tell the story of some of these. 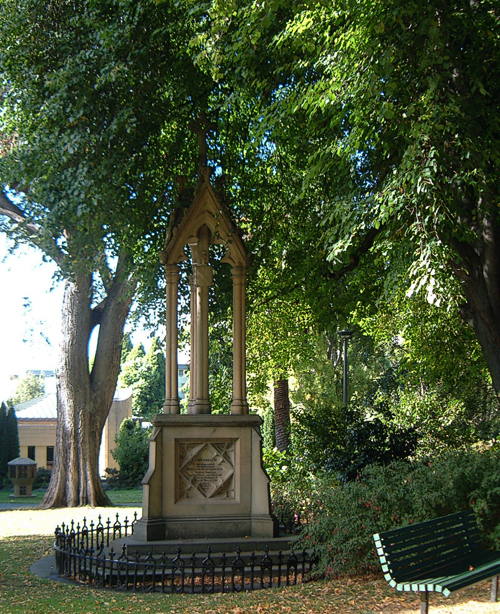 John is an entertaining presenter and has many pictures to illustrate his story.
. . . but this is old Hobart, St David’s Park just up from Salamanca Place and I was going to say that there is absolutely nothing contemporary in the park or vicinity. Then I realised that the eastern side of the park runs into the nice modern Supreme Court building from the 1960s. 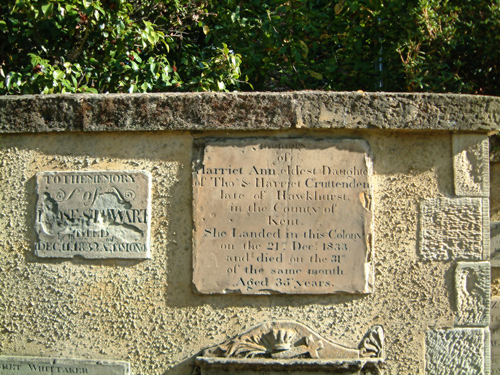 The winding wall between St David’s and the court precinct has been punctuated with reclaimed tombstones placed in a readable but random way. 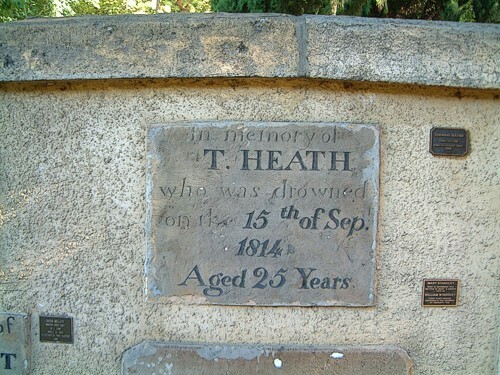 The names, dates and particularly the epitaphs I found worthy of photographs and quite thoughts – especially one with Barbara’s Father’s surname although that family say there’s no connection. 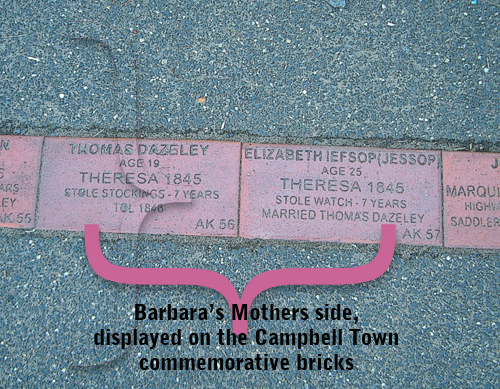 Barbara’s Mothers side is also set into stone in the form of commemorative bricks to her two convict ancestors in Campbell Town – here. 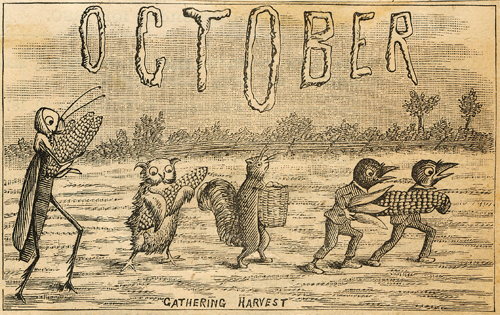 the downloadable 5 Mb .pdf is here.